This week’s writing post comes to you courtesy author D.B. Jackson, whose new novel Thieftaker will be out tomorrow. Wait, let me underline that, because I’m excited: TOMORROW. I asked Jackson to tell me a little about how he developed the magic system for his new series of novels, which combine some of my favorite fictional flavors: they’ve got history, crime and fantasy, all in one go! Here’s the cover. Here’s the first chapter, courtesy Tor.com. And here’s D.B. Jackson, talking about creating magic systems. In developing the magic system for my newest book, Thieftaker , a historical urban fantasy that will be released by Tor books on July 3, I tried to find a balance between following a set of old rules and bringing an innovative approach to conjuring. The result is a form of magic that is powerful enough to make for interesting plot points, but limited enough to ensure that my protagonist will have to rely as much on his wits as on his magic. 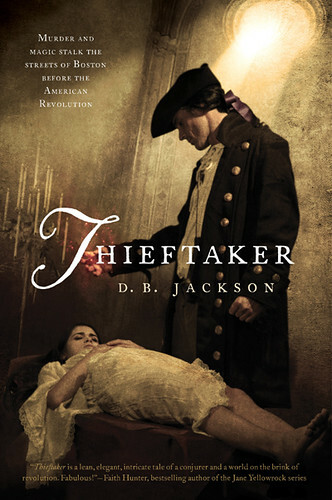 Thieftaker tells the story of Ethan Kaille, a conjurer and thieftaker (sort of an 18th century private investigator) living in Colonial Boston in the 1760s, as the North American colonies are beginning to chafe at British rule. So my first goal in creating my magic system was to come up with something that was not only cool, but that also blended well with my colonial setting. Of course there were (as far as history can tell us) no conjurers in the Province of Massachusetts Bay. But there were witch scares, the most famous of which, the Salem Witch Trials of 1692, led to the imprisonment of 150 “witches” and the execution of twenty men and women. I wanted my hero to face the possibility of persecution for his conjuring — I thought that would add tension to the novel — and so I created a magic system that could be confused with witchcraft by people of the time. Ethan’s magic appears to the unsuspecting to come out of nowhere; he doesn’t need a magical stone or a staff or any other physical tool to conjure, although for some spells he does need to spill his own blood. But that only adds to the whole “dabbling in the black arts” feel of the magic. While in my version of 1760s Boston there is no such thing as witchcraft, conjurers are constantly being accused of being witches, and Ethan lives in fear of being hanged as a witch. In other respects, though, my system of magic for this book is similar to those I’ve developed for other projects. I use three strict guidelines for my magic systems, no matter the world in which I’m writing. First, my magic follows a set of rules that remains consistent throughout the book. My goal in creating a magic system is to come up with something that feels as real and natural and rooted in the world I’ve created as any natural law of our own world. In my opinion, magic should seem as ironclad and constant as the law of gravity. As soon as the rules of magic begin to shift or soften according to narrative needs, the magic ceases to be a realistic part of the worldbuilding and becomes instead a plot device, and a transparent one at that. Second, my magic is limited in scope and power. Magic that can do anything and everything, that can’t be defeated, is destined to take over a story or series. At least that has been my experience. By placing limits on what my magic can do, I force my characters who have magic to rely as much on their intelligence and physical skills as much as they do their spells. In my opinion, that makes for more interesting characters and storytelling. So Ethan can only cast so many spells before he begins to tire and weaken. His spells can do some pretty cool stuff — among other things, he can heal wounds, he can change the shape of matter, he can move unseen among those who do not have magic — but he can’t, say, make himself fly or move through time. Magic is a tool, even a weapon at times. But it is not all-powerful. After establishing the framework for my magic system with these guidelines in mind, I could then turn to the fun part of creating a magic system; you know: the cool stuff. Ethan’s conjurings consist of four elements. The first is the spell itself, which has to be spoken in Latin. The second is the “fuel” or source of the spell that I mentioned a moment ago: water, blood, a life, etc. The third is the conjurer him or herself. And the fourth, is a spirit guide who allows the conjurer to access the power that dwells between the world of the living and the realm of the dead. This spirit usually takes the form of a glowing ghost (for want of a better word) who appears whenever a spell is cast. Ethan’s ghost takes the form of a silent, dour old soldier wearing chain mail and a tabard bearing the sigil of the ancient Plantagenet kings. He reminds Ethan of his mother’s splenetic brother, Reginald, and so Ethan calls the ghost Uncle Reg, much to the shade’s annoyance. But though their relationship in the book provides some comic relief, the ghost plays a serious role in the magic system: Without him, Ethan could not conjure, because he could not access that magical realm. Finally, there is one other written element that has been crucial to making my magic system blend with my historical setting. In the book, I never use the word “magic” to describe it. After discussing the matter with my editor, we agreed that magic would have been an anachronistic term. “Magick” was considered a dark practice and was associated strongly with witchcraft in sermons and tracts that condemned both by name. Conjurers, who sought to distinguish their spellmaking from “witchery,” would never have used the word magic to describe their abilities. And so Ethan speaks of conjuring, of casting spells, spellmaking, of his “talents.” But he never calls it magic for fear of finding himself at the wrong end of a hangman’s noose. I hope that the magic I have created for Thieftaker will feel like a natural part of my historical setting, that it will seem consistent and “realistically” limited, and that it will entertain and occasionally elicit a “Cool!” from my readers. Those have been my goals as I have created and refined it. Because as a reader, as well as a writer, those are the things I look for in magic systems. D.B. Jackson is also David B. Coe, the award-winning author of a dozen fantasy novels. His first book as D.B. Jackson, Thieftaker , volume I of the Thieftaker Chronicles, will be released by Tor Books on July 3. D.B. lives on the Cumberland Plateau with his wife and two teenaged daughters. They’re all smarter and prettier than he is, but they keep him around because he makes a mean vegetarian fajita. When he’s not writing he likes to hike, play guitar, and stalk the perfect image with his camera. I ADORE you have gay and trans characters and it’s NBD. thanks for writing what I want the world to be. Folks, this not only swelled my ego, it darn near made me cry. Second, I believe M.K. Hobson’s Kickstarter for THE WARLOCK’S CURSE starts today, on lucky Friday the Thirteenth. My blogging routine has been thrown to the winds this week, naturally, by the Blue Magic release. It’ll all get back to normal soon, though with a lingering probability of “And now I’m guest blogging here!” showers. Also because of the release, I’ve hit a stretch where it’s become obvious that, if I choose, I could spend all day every day just answering e-mails. Here’s a thing: the faster you run on the e-mail wheel, the faster the notes come pouring back. Instead of scrambling like Alice and never getting anything real accomplished, I have made a real effort to move at a sane speed: do a couple things I need to (like, oh, my taxes?) and then clear out the inbox. Then go for a walk so I don’t become a mole person, clear it out again. Right now it all seems to be working. Or I’m deluded; we’ll see which turns out to be true. 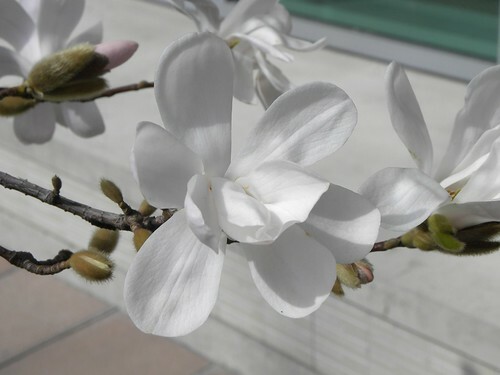 When I first moved here, I didn’t know these were star magnolias. For a few years, we called them Daisy Trees. This being Monday, I am at Favorite Thing Ever, blogging about the wonders of The Vinyl Cafe. Or, if you’d like a behind-the-scenes look at Indigo Springs, check out “Magic Calls to Magic” in the Tor-Forge blog. Enjoy! 2:00:pm Does writing speed matter? If you cannot be there and want to hang out with me in a more virtual fashion, my Quantum Leap rewatch of M.I.A. is now live at Tor.com. Happy Monday, everyone! If you are looking for a distraction, consider heading over to Favorite Thing Ever, where I am all abwee with love for Neal Stephenson’s eco-thriller Zodiac and Kelly tells you about the delightful The Pillow Book of Sei Shonagun.